Hundreds of Narconon supporters, dignitaries and guests gathered in Villa Victoria, Mexico, September 12, to celebrate the opening of the new Continental Narconon Center to serve all 21 nations of Latin America. Those on hand for the inauguration of Narconon Latin America, Saturday, September 12, were witness to an historic occasion for drug rehabilitation on the continent. The joyous response of the audience to the pulling of the ribbon reflected their passionate support of the program. The lively rhythms of a mariachi band added to the excitement, sweeping the audience up in the spirit of the occasion. The ribbon fell, signaling a new era of help for an entire region suffering from epidemic drug abuse. To the cheers of those gathered for the opening, the ribbon was cut on the new Continental Narconon Latin America drug rehabilitation and training center. Those attending streamed through the opened doors to glimpse the magnificent facility. Only 90 minutes from Mexico City, Narconon Latin America is located on a 19th century, four-acre hacienda, once the home of a world-renowned matador. Entering the new Continental Narconon, one is struck by the beauty and serenity of the setting—a perfect location for those seeking to overcome addiction. The exceptional quality of the Narconon program is reflected throughout the facility. Narconon Latin America welcomes those seeking drug rehabilitation as well as specialists looking to establish new Narconon centers in cities and towns throughout Mexico and Central and South America. The former chapel of the 19th century hacienda has been beautifully restored and now serves as the center’s auditorium. In the spacious auditorium, students and those training to open or work at existing Narconon centers attend events and student graduations. The Narconon Latin America dining room is beautifully appointed to provide students with a comfortable, aesthetic environment. At Narconon Latin America, every amenity is designed with complete and successful rehabilitation in mind. Formerly owned by one of the world’s most prominent matadors, the hacienda’s arena reflects the historic and cultural heritage of the region. Serving all 21 nations of Latin America, this incomparable Narconon center provides the ideal setting for drug and alcohol rehabilitation as well as the training of Narconon specialists to open new centers throughout the region. The Continental Narconon for Latin America opened its doors wide on Saturday, September 12, in a joyous and passionate celebration in the heart of Mexico attended by hundreds of Narconon supporters, dignitaries and guests, including 150 members of the Mexico State Special Auxiliary Police Force. This new facility in the town of Villa Victoria, built in 1880 and formerly owned by a world-renowned matador, is designed to deliver the famed Narconon drug rehabilitation methods in a distraction-free setting that is perfectly suited to the needs of those seeking to overcome their addictions and live drug-free lives. Built around an interior courtyard surrounded by classical arcaded walkways, the beauty and serenity of the secluded setting at Narconon Latin America provides students a tranquil and uniquely personal atmosphere. 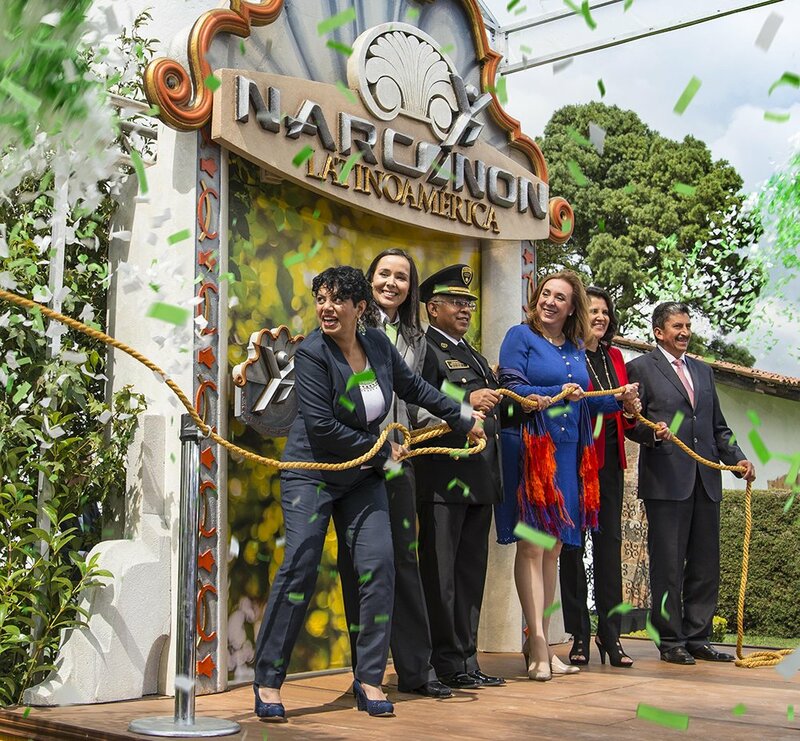 Narconon Latin America opens her doors in what is a boom period of growth for Narconon’s global network that will effectively deliver the pioneering program based on the discoveries and writings of Scientology Founder L. Ron Hubbard. It will also provide training for specialists looking to establish new Narconon centers in cities and towns throughout the 21 nations of Latin America. Building on the congresswoman’s inspiring speech was Region XIX Police Commander Benjamin Salvador Jimenez, a strong advocate for drug-free living. He stepped to the platform to explain why he is personally honored to welcome Narconon to his country. And finally, Ms. Rosi Orozco, president of the nongovernmental Commission United Against Human Trafficking and former member of Congress, shared her own passion for the Narconon program and what it means in a country so threatened by drugs at every echelon of society. Ms. Orozco is hardly alone in that belief. For nearly 50 years, the Narconon program has saved the lives of countless individuals who were thought lost to substance abuse forever. Its mission is to provide an effective path for drug abuse rehabilitation and to assist society in reversing the scourge of abuse worldwide. Narconon addresses those in the program as “students” rather than “addicts” or “victims,” and its sole purpose is to provide people with the tools to lead successful drug-free lives. Every detail is considered to give students the stability and comfort they need to help free them from addiction and rebuild their lives without drugs. The Narconon program begins with a drug-free, nonmedical withdrawal process designed to assist the individual in shedding a dependence on drugs as rapidly and comfortably as possible. It is followed by a distinctive method of detoxification, specifically geared to help drug users eliminate the residues in the body that drive cravings, while at the same time supporting the body with supplements. The final component of the program is a series of Life Skills Courses that furnish students the tools needed to remain drug-free throughout their lifetime. This new state-of-the-art Narconon Latin America in Mexico was made possible by generous contributions from members of the International Association of Scientologists. It is the third such center to open in the past week, continuing a monumental phase of growth for the Narconon network. It was preceded by the opening of the Continental Narconon Europe and Narconon United Kingdom on September 5. Opening next is a Narconon facility atop the mountains in Ojai, California, specifically dedicated to providing drug rehabilitation services to artists and leaders in society. Narconon centers operate today in some 23 countries on six continents. For more information, visit narconon.org.